Jerusalem's population size and composition has shifted many times over its 5,000 year history. Since medieval times, the Old City of Jerusalem has been divided into Jewish, Muslim, Christian, and Armenian quarters. Most population data pre-1905 is based on estimates, often from foreign travellers or organisations, since previous census data usually covered wider areas such as the Jerusalem District. These estimates suggest that since the end of the Crusades, Muslims formed the largest group in Jerusalem until the mid-19th century. Between 1838 and 1876, a number of estimates exist which conflict as to whether Jews or Muslims were the largest group during this period, and between 1882 and 1922 estimates conflict as to exactly when Jews became a majority of the population. In 2003, the total population of Jerusalem was 693,217, including 464,527 Jews and 228,690 "Arabs and others" (Choshen 1), that same year the population of the Old City was 3,965 Jews and 31,405 "Arabs and others" (Choshen 12). 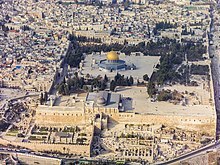 2.5.2 Muslim or Jewish "relative majority"
Jerusalemites are of varied national, ethnic and religious denominations and include European, Middle Eastern and African Jews, Georgians, Armenians, and Muslim, Protestant, Greeks, Greek Orthodox Arabs, Syrian Orthodox and Coptic Orthodox Arabs, among others. Many of these groups were once immigrants or pilgrims that have over time become near-indigenous populations and claim the importance of Jerusalem to their faith as their reason for moving to and being in the city. Jerusalem's long history of conquests by competing and different powers has resulted in different groups living in the city many of whom have never fully identified or assimilated with a particular power, despite the length of their rule. Though they may have been citizens of that particular kingdom and empire and involved with civic activities and duties, these groups often saw themselves as distinct national groups (see Armenians, for example). The Ottoman millet system, whereby minorities in the Ottoman Empire were given the authority to govern themselves within the framework of the broader system, allowed these groups to retain autonomy and remain separate from other religious and national groups. Some Palestinian residents of the city prefer to use the term Maqdisi or Qudsi as a Palestinian demonym. The tables below provide data on demographic change over time in Jerusalem, with an emphasis on the Jewish population. Readers should be aware that the boundaries of Jerusalem have changed many times over the years and that Jerusalem may also refer to a district or even a subdistrict under Ottoman, British, or Israeli administration, see e.g. Jerusalem District. Thus, year-to-year comparisons may not be valid due to the varying geographic areas covered by the population censuses. In the Achaemenid Yehud Medinata (Judah Province) the population of Jerusalem is estimated at between 1500 and 2750. During the First Jewish–Roman War (66–73 CE), the population of Jerusalem was estimated at 600,000 persons by Roman historian Tacitus, while Josephus estimated that there were as many as 1,100,000 who were killed in the war. Josephus also wrote that 97,000 Jews were sold as slaves. After the Roman victory over the Jews, as many as 115,880 dead bodies were carried out through one gate between the months of Nisan and Tammuz. Jerusalem's population during the final Roman Siege of Jerusalem in 70 (CE) has been variously estimated to be around 70,398 by Wilkinson in 1974, 80,000 by Broshi in 1978, and 60,000–70,000 by Levine in 2002. According to Josephus, the populations of adult male scholarly sects were as follows: over 6,000 Pharisees, more than 4,000 Essenes and "a few" Sadducees. New Testament scholar Cousland notes that "recent estimates of the population of Jerusalem suggest something in the neighbourhood of a hundred thousand". A minimalist view is taken by Hillel Geva, who estimates from archaeological evidence that the population of Jerusalem before its 70 CE destruction was at most 20,000. Henry Light, who visited Jerusalem in 1814, reported that Muslims comprised the largest portion of the 12,000 person population, but that Jews made the greatest single sect. In 1818, Robert Richardson, family doctor to the Earl of Belmore, estimated the number of Jews to be 10,000, twice the number of Muslims. Muslim or Jewish "relative majority"
Between 1838 and 1876, conflicting estimates exist regarding whether Muslims or Jews constituted a "relative majority" (or plurality) in the city. Writing in 1841, the biblical scholar Edward Robinson noted the conflicting demographic estimates regarding Jerusalem during the period, stating in reference to an 1839 estimate attributed to the Moses Montefiore: "As to the Jews, the enumeration in question was made out by themselves, in the expectation of receiving a certain amount of alms for every name returned. It is therefore obvious that they here had as strong a motive to exaggerate their number, as they often have in other circumstances to underrate it. Besides, this number of 7000 rests merely on report; Sir Moses himself has published nothing on the subject; nor could his agent in London afford me any information so late as Nov. 1840." In 1843, Reverend F.C. Ewald, a Christian traveler visiting Jerusalem, reported an influx of 150 Jews from Algiers. He wrote that there were now a large number of Jews from the coast of Africa who were forming a separate congregation. From the mid-1850s, following the Crimean War, the expansion of Jerusalem outside of the Old City began, with institutions including the Russian Compound, Kerem Avraham, the Schneller Orphanage, Bishop Gobat school and the Mishkenot Sha'ananim marking the beginning of permanent settlement outside the Jerusalem Old City walls. Between 1856 and 1880, Jewish immigration to Palestine more than doubled, with the majority settling in Jerusalem. The majority of these immigrants were Ashkenazi Jews from Eastern Europe, who subsisted on Halukka. In 1881–82, a group of Jews arrived from Yemen as a result of messianic fervor, in the phase known as the First Aliyah. After living in the Old City for several years, they moved to the hills facing the City of David, where they lived in caves. In 1884, the community, numbering 200, moved to new stone houses built for them by a Jewish charity. The Jewish population of Jerusalem, as for wider Palestine, increased further during the Third Aliyah of 1919–23 following the Balfour Declaration. Prior to this, a British survey in 1919 noted that most Jews in Jerusalem were largely Orthodox and that a minority were Zionists. As of 24 May 2006, Jerusalem's population was 724,000 (about 10% of the total population of Israel), of which 65.0% were Jews (c. 40% of whom live in East Jerusalem), 32.0% Muslim (almost all of whom live in East Jerusalem) and 2% Christian. 35% of the city's population were children under age of 15. In 2005, the city had 18,600 newborns. These official Israeli statistics refer to the expanded Israel municipality of Jerusalem. This includes not only the area of the pre-1967 Israeli and Jordanian municipalities, but also outlying Palestinian villages and neighbourhoods east of the city, which were not part of Jordanian East Jerusalem prior to 1967. Demographic data from 1967 to 2012 showed continues growth of Arab population, both in relative and absolute numbers, and the declining of Jewish population share in the overall population of the city. In 1967, Jews were 73.4% of city population, while in 2010 the Jewish population shrank to 64%. In the same period the Arab population increased from 26,5% in 1967 to 36% in 2010. In 1999, the Jewish total fertility rate was 3.8 children per woman, while the Palestinian rate was 4.4. This led to concerns that Arabs would eventually become a majority of the city's population. Between 1999 and 2010, the demographic trends reversed themselves, with the Jewish fertility rate increasing and the Arab rate decreasing. In addition, the number of Jewish immigrants from abroad choosing to settle in Jerusalem steadily increased. By 2010, there was a higher Jewish than Arab growth rate. 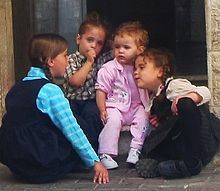 That year, the city's birth rate was placed at 4.2 children for Jewish mothers, compared with 3.9 children for Arab mothers. In addition, 2,250 Jewish immigrants from abroad settled in Jerusalem. The Jewish fertility rate is believed to be still currently increasing, while the Arab fertility rate remains on the decline. Jerusalem had population of 801,000 in 2011, of which Jews compromised 497,000 (62%), Muslims 281,000 (35%), Christians 14,000 (around 2%) and 9,000 (1%) were not classified by religion. c. 1000 BCE: According to the Bible, King David conquers Jerusalem and makes it the capital of the Kingdom of Israel (2 Samuel 5:6–7:6). His son King Solomon builds the First Jewish Temple on the Temple Mount. 530 BCE: The Second Jewish Temple was rebuilt, on the same Temple Mount as the first Jewish Temple. 350 BCE: Jerusalem revolts against Artaxerxes III, who retakes the city and burns it down in the process. Jews who supported the revolt are sent to Hyrcania on the Caspian Sea. 332–200 BCE: Jerusalem capitulates to Alexander the Great, and is later incorporated into the Ptolemaic Kingdom (301BCE) and Seleucid Empire (200BCE). 175 BCE: Antiochus IV Epiphanes accelerates Seleucid efforts to eradicate the Jewish religion, outlaws Sabbath and circumcision, sacks Jerusalem and erects an altar to Zeus in the Second Temple after plundering it. 164 BCE: The Hasmoneans take control of part of Jerusalem, whilst the Seleucids retain control of the Acra (fortress) in the city and most surrounding areas. 136: Hadrian formally reestablishes the city as Aelia Capitolina, and forbids Jewish and Christian presence in the city. Restrictions over Christian presence in the city are relaxed two years later. 614: Jerusalem falls to Jewish and Persian forces, specifically Khosrow II's Sasanian Empire until it is retaken in 629. This was a result of the Jewish revolt against Heraclius, a Jewish insurrection against the Byzantine Empire across the Levant. The Church of the Holy Sepulchre is burned and much of the Christian population is massacred. 636–7: Caliph Umar conquers Jerusalem. According to Muhammad ibn Jarir al-Tabari, Patriarch Sophronius and Umar are reported to have agreed the Pact of Umar, which guaranteed Christians freedom of religion but prohibited Jews from living in the city. The Armenian Apostolic Church began appointing its own bishop in Jerusalem in 638. A surviving Jewish chronicle from the Cairo Geniza however states that Umar permitted seventy Jewish families to settle in the city. The Jews requested to settle in the southern part of the city near the Temple Mount which was granted, evidence of this location of the Jewish quarter is provided in a Geniza letter dated 1064. Later Jewish texts from tenth and eleventh century also indicate the "King of Ishmael" allowing them to settle in the city. 797: Abbasid–Carolingian alliance – the Church of the Holy Sepulchre was restored and the Latin hospital was enlarged, encouraging Christian travel to the city. 1009–30: Fatimid Caliph Al-Hakim orders destruction of churches and synagogues in the empire, including the Church of the Holy Sepulchre. Caliph Ali az-Zahir authorizes them rebuilt 20 years later. 1077: Jerusalem revolts against the rule of Emir Atsiz ibd Uvaq who retakes the city and massacres the local population. 1099: First Crusaders capture Jerusalem and slaughter most of the city's Muslim and Jewish inhabitants. The Dome of the Rock is converted into a church. 1187: Saladin captures Jerusalem from Crusaders and allows Jewish and Orthodox Christian settlement. The Dome of the Rock is converted to an Islamic center of worship again. 1229: A 10-year treaty is signed allowing Christians freedom to live in the unfortified city. The Ayyubids retained control of the Muslim holy places. 1244: Mercenary army of Khwarazmians destroyed the city. 1482: The visiting Dominican priest Felix Fabri described Jerusalem as "a collection of all manner of abominations". As "abominations" he listed Saracens, Greeks, Syrians, Jacobites, Abyssianians, Nestorians, Armenians, Gregorians, Maronites, Turcomans, Bedouins, Assassins, a sect possibly Druzes, Mamelukes, and "the most accursed of all", Jews. Only the Latin Christians "long with all their hearts for Christian princes to come and subject all the country to the authority of the Church of Rome". 1604: First Protectorate of missions agreed, in which the Christian subjects of Henry IV of France were free to visit the Holy Places of Jerusalem. French missionaries begin to travel to Jerusalem. 1700: Judah the Pious and 1,000 followers settle in Jerusalem. 1774: The Treaty of Küçük Kaynarca is signed giving Russia the right to protect all Christians in Jerusalem. 1837: Galilee earthquake of 1837 results in Jews from Safed and Tiberias resettling in Jerusalem. 1839–40: Rabbi Judah Alkalai publishes "The Pleasant Paths" and "The Peace of Jerusalem", urging the return of European Jews to Jerusalem and Palestine. 1853–4: A treaty is signed confirming France and the Roman Catholic Church as the supreme authority in the Holy Land with control over the Church of the Holy Sepulchre, contravening the 1774 treaty with Russia and triggering the Crimean War. 1860: The first Jewish neighborhood (Mishkenot Sha'ananim) outside the Old City walls is built, in an area later known as Yemin Moshe, by Moses Montefiore and Judah Touro. 1873–75: Mea Shearim is built. 1917: The Ottomans are defeated at the Battle of Jerusalem during the World War I and the British Army takes control. The Balfour Declaration had been issued a month before. 1947–49: Palestine war led to displacement of Palestinian Arab and Jewish populations in the city and its division. All Jewish residents of the eastern part of the city were expelled by Arab forces and the entire Jewish Quarter was destroyed. Palestinian Arab villages such as Lifta, al-Maliha, Ayn Karim and Deir Yassin were depopulated. 1967: The Six-Day War results in East Jerusalem being captured by Israel and few weeks later expansion of the Israeli Jerusalem Municipality to East Jerusalem and some surrounding area. The Old City is captured by the IDF and the Moroccan Quarter, comprising 135 houses and the 12th-century Afdaliya or Sheikh Eid Mosque, is demolished, creating a plaza in front of the Western Wall. Israel declares Jerusalem unified and announces free access to holy sites of all religions. ^ Hecht, Richard (2000). To Rule Jerusalem. p. 189. ^ "Jerusalem". JewishEncyclopedia.com. 1903-11-15. Retrieved 2015-10-23. ^ Wilkinson, "Ancient Jerusalem, Its Water Supply and Population", PEFQS 106, pp. 33–51 (1974). ^ "According to Levine, because the new area encompassed by the Third Wall was not densely populated, assuming that it contained half the population of the rest of the city, there were between 60,000 and 70,000 people living in Jerusalem. ", Rocca, "Herod's Judaea: A Mediterranean State in the Classical World", p. 333 (2008). Mohr Siebeck. ^ Stern, Sacha (2011-04-21). Sects and Sectarianism in Jewish History. BRILL. ISBN 9004206485. ^ Cousland, "The Crowds in the Gospel of Matthew", p. 60 (2002). Brill. ^ Hillel Geva (2013). "Jerusalem's Population in Antiquity: A Minimalist View". Tel Aviv. 41 (2): 131–160. ^ a b c d Amnon Cohen and Bernard Lewis (1978). Population and Revenue in the Towns of Palestine in the Sixteenth Century. Princeton University Press. pp. 14–15, 94. ISBN 0-691-09375-X. The registers give counts of tax-paying households, bachelors, religious men, and disabled men. We followed Cohen and Lewis on taking 6 as the average household size, even though they call it "conjectural" and note that other scholars have suggested averages between 5 and 7. ^ Light, Henry (1818). Travels in Egypt, Nubia, Holy Land, Mount Libanon and Cyprus, in the year 1814. Rodwell and Martin. p. 178. The population is said to be twelve thousand, of which the largest proportion is Mussulmen: the greatest of one sect are Jews: the rest are composed of Christians of the East, belonging either to the Armenian, Greek, Latin, or Coptish sects. ^ Richardson, Robert (1822). Travels Along the Mediterranean and Parts Adjacent: In Company with the Earl of Belmore, During the Years 1816-17-18: Extending as Far as the Second Cataract of the Nile, Jerusalem, Damascus, Balbec, &c. ... T. Cadell. pp. 256–. ^ John Griffith Mansford (M.R.C.S.) (1829). A Scripture Gazetteer; or, geographical and historical dictionary of places and people, mentioned in the Bible. p. 244. ^ Ulrich Jasper Seetzen (2007-09-27). "A Brief Account of the Countries Adjoining the Lake of Tiberias, the Jordan ..." Books.google.com. Retrieved 2015-10-23. ^ Sharkansky, Ira (1996). Governing Jerusalem: Again on the world's agenda. Wayne State University Press. p. 121. ISBN 0-8143-2592-0. ^ a b c d e f g h i j k l m n Kark, Ruth; Oren-Nordheim, Michal (2001). Jerusalem and its environs: quarters, neighborhoods, villages, 1800-1948. Wayne State University Press. p. 28. ISBN 0-8143-2909-8. ^ Turner, William (1820). Journal of a Tour in the Levant. John Murray. pp. 264–. ^ Joliffe, Thomas R. (1822). Letters from Palestine: Description of a Tour Through Galilee and Judea. To which are Added Letters from Egypt. ^ Buckingham, James Silk (1821). Travels in Palestine through the countries of Bashan and Gilead, east of the River Jordan, including a visit to the cities of Geraza and Gamala in the Decapolis. London: Longman, Hurst, Rees, Orme and Brown. During our stay here, I made the most accurate estimate that my means of information admitted, of the actual population of Jerusalem at the present moment. From this it appeared that the fixed residents, more than one half of whom are Mohammedans, are about eight thousand; but the continual arrival and departure of strangers, make the total number of those present in the city from ten to fifteen thousand generally, according to the season of the year. The proportion which the numbers of those of different sects bear to each other in this estimate, was not so easily ascertained. The answers which I received to enquiries on this point, were framed differently by the professors of every different faith. Each of these seemed anxious to magnify the number of those who believed his own dogmas, and to diminish that of the professors of other creeds. Their accounts were therefore so discordant, that no reliance could be placed on the accuracy of any of them. The Mohammedans are certainly the most numerous, and these consist of nearly equal portions of Osmanli Turks, from Asia Minor; descendents of pure Turks by blood, but Arabians by birth; a mixture of Turkish and Arab blood, by intermarriages; and pure Syrian Arabs, of an unmixed race. Of Europeans, there are only the few monks of the Catholic convent, and the still fewer Latin pilgrims who occasionally visit them. The Greeks are the most numerous of ail the Christians, and these are chiefly the clergy and devotees. The Armenians follow next in order, as to numbers, but their body is thought to exceed that of the Greeks in influence and in wealth. The inferior sects of Copts, Abyssinians, Syrians, Nestorians, Maronites, Chaldeans, &c. are scarcely perceptible in the crowd. And even the Jews are more remarkable from the striking peculiarity of their features and dress, than from their numbers, as contrasted with the other bodies. ^ Edward Robinson. "Biblical Researches in Palestine, Mount Sinai and Arabia Petraea: A Journal ..." Books.google.co.uk. Retrieved 2015-10-23. ^ Kark, Ruth; Oren-Nordheim, Michal (2001). Jerusalem and Its Environs: Quarters, Neighborhoods, Villages, 1800–1948. Wayne State University Press. pp. 74, table on p.82–86. ISBN 0-8143-2909-8. The beginning of construction outside the Jerusalem Old City in the mid-19th century was linked to the changing relations between the Ottoman government and the European powers. After the Crimean War, various rights and privileges were extended to non-Muslims who now enjoyed greater tolerance and more security of life and property. All of this directly influenced the expansion of Jerusalem beyond the city walls. From the mid-1850s to the early 1860s, several new buildings rose outside the walls, among them the mission house of the English consul, James Finn, in what came to be known as Abraham’s Vineyard (Kerem Avraham), the Protestant school built by Bishop Samuel Gobat on Mount Zion; the Russian Compound; the Mishkenot Sha’ananim houses: and the Schneller Orphanage complex. These complexes were all built by foreigners, with funds from abroad, as semi-autonomous compounds encompassed by walls and with gates that were closed at night. Their appearance was European, and they stood out against the Middle-Eastern-style buildings of Palestine. ^ a b S. Zalman Abramov (1918-05-13). "Perpetual Dilemma: Jewish Religion in the Jewish State". Books.google.co.uk. Retrieved 2015-10-23. ^ "Jerusalem, eine Vorlesung". Archive.org. Retrieved 2015-10-23. ^ Titus Tobler (1867). Bibliographica geographica Palaestinae: Zunächst kritische uebersicht gedruckter und ungedruckter beschreibungen der reisen ins Heilige Land. S. Hirzel. ^ Scholch 1985, p. 492. ^ Scholch 1985, p. 491. ^ "Montefiore Families". Montefiorecensuses.org. Archived from the original on 2015-11-07. Retrieved 2015-10-23. ^ "Histoire de la rivalité et du protectorat des églises chrétiennes en Orient". Archive.org. Retrieved 2015-10-23. ^ Gold, Dore (2009). The Fight For Jerusalem. Regnery publishing. p. 120. ISBN 978-1-59698-102-7. ^ The New York Times, February 19, 1869 ; See also I. Harold Scharfman, The First Rabbi, Pangloss Press, 1988, page 524 which reports the figure as 3,100. ^ Scholch 1985, p. 486, Table 1. ^ Nini, Yehuda (1991). The Jews of the Yemen, 1800–1914. Taylor & Francis. pp. 205–207. ISBN 978-3-7186-5041-5. ^ Wisemon, Tamar (2008-02-28). "Streetwise: Yemenite steps - Magazine - Jerusalem Post". Jpost.com. Retrieved 2015-10-23. ^ Man, Nadav (9 January 2010). "Behind the lens of Hannah and Efraim Degani – part 7". Ynet. ^ Rhett, Maryanne A. (19 November 2015). The Global History of the Balfour Declaration: Declared Nation. Routledge. ISBN 978-1-317-31276-5. ^ Review Of Reviews. Volume IX. Jan–Jun, 1894. Albert Shaw, Editor. Page 98. "The present population of Jerusalem is not far from forty thousand, and more than half are Jews." ^ Gād G. Gîlbar (1990). Ottoman Palestine, 1800-1914: Studies in Economic and Social History. Brill Archive. p. 35. ISBN 90-04-07785-5. ^ "Jerusalem Day" (PDF). Cbs.gov.il. Retrieved 2015-10-23. ^ "Jerusalem : Facts and Trends 2012" (PDF). Jiis.gov. Retrieved 2015-10-23. ^ "Is Jerusalem Being "Judaized"? | Jerusalem Center For Public Affairs". Jcpa.org. 2003-03-01. Retrieved 2015-10-23. ^ "Press release : Population : End of 2011 (provisional data)" (PDF). Jiis.gov. Retrieved 2015-10-23. ^ "Selected Data on the Occasion of Jerusalem Day" (PDF). Israel Central Bureau of Statistics. 16 May 2012. Retrieved 3 January 2014. ^ "Kingdoms of the Levant - Israelites". Historyfiles.co.uk. Retrieved 2015-10-23. ^ Schaff's Seven Ecumenical Councils: First Nicaea: Canon VII: "Since custom and ancient tradition have prevailed that the Bishop of Aelia [i.e., Jerusalem] should be honored, let him, saving its due dignity to the Metropolis, have the next place of honor. "; "It is very hard to determine just what was the “precedence” granted to the Bishop of Aelia, nor is it clear which is the "metropolis" referred to in the last clause. Most writers, including Hefele, Balsamon, Aristenus and Beveridge consider it to be Cæsarea; while Zonaras thinks Jerusalem to be intended, a view recently adopted and defended by Fuchs; others again suppose it is Antioch that is referred to." ^ Hussey, J.M. 1961. The Byzantine World. New York, New York: Harper & Row, Publishers, p. 25. ^ Joshua Prawer, Haggai Ben-Shammai (1996). The History of Jerusalem: The Early Muslim Period (638–1099). NYU Press. p. 172. ISBN 978-0-8147-6639-2. ^ Pamela Berger (2012). The Crescent on the Temple: The Dome of the Rock as Image of the Ancient Jewish Sanctuary. Brill Publishers. pp. 45, 46. ISBN 9004203001. ^ Heck, Gene W. (2006). Charlemagne, Muhammad, and the Arab roots of capitalism. p. 172. ISBN 9783110192292. ^ "Mishkenot Sha'ananim". Jewish Virtual Library. Retrieved 2015-10-23. ^ "S/8439* of 6 March 1968". Unispal.un.org. Archived from the original on 2011-05-15. Retrieved 2015-10-23. Jewish National Council (1947). "First Memorandum: historical survey of the waves of the number and density of the population of ancient Palestine; Presented to the United Nations in 1947 by Vaad Leumi on Behalf of the Creation of a Jewish State" (PDF). Archived from the original (PDF) on 2012-03-08. Jewish National Council (1947). "Second Memorandum: historical survey of the Jewish population in Palestine from the fall of the Jewish state to the beginning of zionist pioneering; Presented to the United Nations in 1947 by Vaad Leumi on Behalf of the Creation of a Jewish State" (PDF). Archived from the original (PDF) on 2012-03-08. Jewish National Council (1947). "Third Memorandum: historical survey of the waves of Jewish immigration into Palestine from the arab conquest to the first zionist pioneers; Presented to the United Nations in 1947 by Vaad Leumi on Behalf of the Creation of a Jewish State" (PDF). Archived from the original (PDF) on 2011-07-08. Salo Baron, A Social and Religious History of the Jews, Columbia University Press, 1983. Bruce Masters, Christians And Jews In The Ottoman Arab World [,[Cambridge University Press]], 2004. United Nations (1983). "International Conference on the Question of Palestine—The Status of Jerusalem". United Nations Information System on the Question of Palestine. Archived from the original on February 13, 2007. Retrieved February 26, 2006. Time Magazine (April 16, 2001). "Jerusalem". Retrieved March 25, 2006. Martin Gilbert (1987). "Jerusalem Illustrated History Atlas". p. 35. Archived from the original on 2010-07-29. Retrieved December 22, 2010. Palestinian Academic Society for the Study of International Affairs (2002). "Jerusalem: Special Bulletin" (PDF). Archived from the original (PDF) on October 4, 2006. Retrieved February 27, 2006. United Nations (1997). "The Status of Jerusalem". UNISPAL. Division for Palestinian Rights. Prepared for, and under the guidance of, the Committee on the Exercise of the Inalienable Rights of the Palestinian People. Archived from the original on November 25, 2001. Retrieved February 26, 2006. Mark Twain (1867). "Innocents Abroad". Retrieved Feb 9, 2014. Scholch, Alexander (1985). "The Demographic Development of Palestine". International Journal of Middle East Studies. 17 (4): 485–505. doi:10.1017/s0020743800029445. JSTOR 163415.